It can be a bit difficult to wear these scarves especially when going to evening parties and formal dinners; however, you can still look very chic when you know how to wear these properly. 1. Wear them around round-neck shirts. If you are trying to reduce the casual appeal of your round-neck shirt, then wrap a cashmere scarf to cover it up. 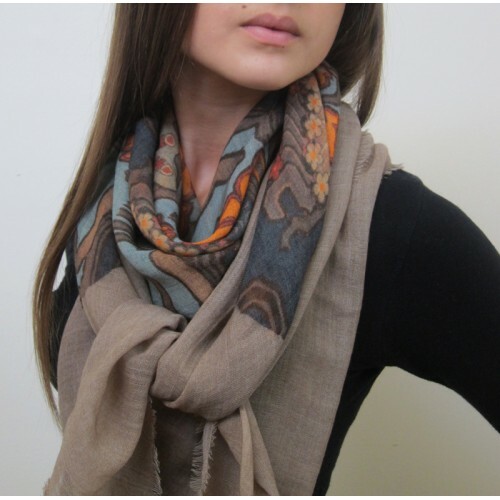 You can use the scarf more as an alternative to a necklace, as it gives you a rather sophisticated and commanding look. What makes these scarves different is that even if they create a posh appeal, they also maintain comfort and warmth around the neck area. Cashmere scarves come in different styles, the most popular being plain, transitional shades, stripes, and tartan. If you have the plain and transitional color shades, you can use them as compliments to plain outfits. For example, you can for bright reds, yellows or blues on gray, white and cream clothes. The rule here is when you’re wearing something dark, compliment with something light. Meanwhile, if you want to look a little vintage, then you can use tartan scarves. These scarves help create a more hipster vibe to the simplest outfits, and are ideal for casual styles. You can also match scarves of this print with denims as they make a great fashion statement. 3. Thin or thick fabrics? Cashmere scarves are produced with many different fabrics & textures. There are the thin, ultra-comfortable ones, which are great for style but less effective when you wish to stay warm. These scarves are best to wear during the spring and summer seasons, as while they are chic, they are not as heavy on the skin. On the other hand, you should select scarves made with a thicker material for the seasons of Fall and Winter. They are warmer and heavier, but at the same time more useful, as you don’t just get to wear them for style purposes, but for warmth as well. 4. Square or not square? If there’s one thing about cashmere scarves, it’s that you won’t see them in square cuts. Most of the scarves of this kind come in rectangle cuts, but since they are very soft, they can be folded and tied easily. If you happen to find square scarves, you may want to use them as a neck centerpiece. This is because when folded properly, these scarves are able to present classy & sophisticated look, which works great especially when compliment with outerwear over your outfit. However, if you have the typical rectangle scarf, then you really have the luxury of doing whatever you like with it. It’s easier to prepare a rectangle scarf, especially when it is made of cashmere. Are you looking for the best of Spring and Summer scarves? Scialle Shawls has a Clearance Sale underway-spring and summer scarves are on sale up to 40% off!